How Much Time Do Standing Desk Users Actually Stand at Their Desks? This is a topic challenging many customers who are thinking of adopting sit-stand desks, and even those who are already using them. Many standing desk users, despite their initial enthusiasm, find they often forget to switch to standing position often enough and wind up spending more time being sedentary than they aimed for. In this article, we examine real-world usage statistics and explore some simple measures that you and your organization can employ to healthfully maximize standing time each day. Another factor in adoption and usage rates is how well employees manage to their personal goals for standing time. KL.7, a Copenhagen-based behavioral design firm, recently conducted a study in which they monitored 54 office workers, collecting data on over 9,100 observations and 4,500 hours of sit-stand activity. During this time, two types of actions were tested at three different workplaces using email reminders and physical or auditory reminders. Office workers either received an email with new content each day at different times or a reminder was placed on their desk for them to feel and hear once every hour. So, just by employing these gentle reminders, workers who were underutilizing their standing desks saw an over 117% increase in standing time. For those that were considered light users, i.e. that typically stood at their desks less than 20% of the time, their standing time increased from 36 minutes per day to 79 minutes per day. So, just by employing these gentle reminders, workers who were underutilizing their standing desks saw an over 117% increase in standing time. That's a phenomenal start towards ensuring that employees see the health and performance benefits of their sit-stand desks. Today, most sit-stand desk owners know there are numerous irrefutable benefits to standing. The reality is that we're all deeply immersed in our professional roles and often forget to move or stand throughout the day, even if we have a sit-stand desk. We hear this a lot even from physicians, who know better than most that sitting too many hours at a computer or in meetings has deleterious effects on their own health. The fact is we get into a mental focus zone in our work sometimes and just don’t remember to change positions–or feel too pressured by deadlines to take the 15 seconds it requires to make the switch. Secondly, workers often feel lethargic because they’ve been working too long in a seated posture. Subconsciously, their bodies are telling them that they need to rest, but in truth the best thing they can do to reenergize is to stand up or move around. We can't trust our own bodies to let us know when it's time to stand and there are very few triggers in the work environment reminding us to stand up while working. The most effective technique is to employ standing desks that have built-in health coach features, like iMovR’s ground-breaking Lander Desks. The good news is there are many ways to set reminders, from setting alarms in our smartphones to placing Post-It® note reminders around our LCD screens. The most effective technique is to employ standing desks that have built-in health coach features, like iMovR’s ground-breaking Lander Desks. Users can personalize how often they want to be reminded to switch to standing, and how they want to be notified–by a subtle pulsing glow on the desk’s hand controller, by push notification to their smartphone or smartwatch, or both. Remarkable as it may seem, the vast majority of standing desk users are not provided with a standing mat at the same time as they are given a sit-stand desk, or at least not a very good one. Anyone whose job entails standing all day, such as pharmacists, checkout clerks, machinists, security guards and even morticians know that standing on your feet all day can hurt. Standing at your desk, especially on hard floors or commercial carpeting with miniscule cushioning, is no different. It may feel good initially, but do it for too long without a proper anti-fatigue mat and you’ll wind up sitting again in short order to get relief from the pain. When complaints of foot and low back pain from workers rises to a crescendo one of three things typically happens, either: a) employees quit to go find jobs that doesn’t require as much standing, b) they spend a lot of time and money on podiatry, chiropractic, massage or other remedies, both on their dime and the company’s, or c) their employer provides them with proper anti-fatigue mats. Such mats, made of 100% polyurethane, reduce foot pain, low back pain and spinal compression while increasing sit-reach flexibility and even improving balance for the people who use them. A good standing mat may add 5%-10% to the cost of a typical standing desk but will result in three to four times more daily usage of that desk in return. The proper mat is essential. Many grocery clerks complain about the old school rubber mats at their counters do literally nothing to lessen foot pain and are in fact just there to prevent slippage in wet environments. Amazon has conducted internal evaluations at some of their fulfillment centers where shipping station clerks were asked to compare how they felt by the end of the day, standing on their cheaper, traditional floor mats versus premium 100% polyurethane mats that are actually designed for all-day standing in shoes. ...Amazon found that this one modest investment in their workers’ health, productivity and job satisfaction has paid great dividends. After a few weeks of continuous testing workers proclaimed a hands-down preference for iMovR’s EcoLast mats, which are now used exclusively for all new stations being added in those centers. In some locations “puzzle piece” mats have been installed that are hundreds of feet long. Among many other employers these days, Amazon found that this one modest investment in their workers’ health, productivity and job satisfaction has paid great dividends. When employees request that their employer provide them with a standing desk, or they pay for one out of their own pocket, they’re much more likely to succeed at meeting their personal standing time goals. However, there’s a much different dynamic when employers proactively install fleets of desks, either in new facilities or when remodeling older ones. When employers retrofit an entire facility with standing desks overnight without first properly socializing the idea among workers, such as in a call center facility, there is often a backlash of resentment from some of the employees. The wrong way is for HR or Facilities to simply send out a memo to employees telling them this is great new benefit the company wants them to have and setting an expectation that the company expects them to stand now. We’ve heard of many cases where these kinds of pronouncements have made workers feel put upon, not appreciated. By and large, gar greater success is achieved by first surveying employees to ask them, “if we were to invest in standing desks for all of you in this department, would you use them?” This empowers employees and leaves them with a feeling that their employer genuinely cares about their welfare, and their opinion. When the desks do arrive, employees are far more likely to say positive things about their company and to spend considerably more time standing at their desks than if it were “imposed” on the workers to do so. Every once in a while, we see a very misleading report circulating in social media claiming that standing desks are bad for your health. One recent study showed that if you stand for extended periods of time, it can lead to negative effects like discomfort and mental sluggishness. But we know that sedentary behavior can have severe effects as well, and 99 out of 100 studies conducted by respected research institutions around the world will bear this out. In truth life is not so binary—it's not just about doing one versus the other. The key is doing the right amount of both. Instead of focusing on sitting versus standing, businesses should be focused on creating the opportunity for movement and encouraging a more active work environment. It’s just common sense. It’s not enough to just help people remember to stand, it needs to be done in a way that doesn't distract their focus or interrupt their work, or the work of those around them. For example, the high-tech hand controller on the iMovR Lander desk was designed to shape users’ behavior in a positive way. It’s not just a panel of buttons for setting the height of the desk and memorizing your height preferences like every other desk controller out there. When [the Lander's controller] pulses it’s time to switch back to standing. And when it turns orange, it's your signal that you’ve been sitting longer than you wanted to. 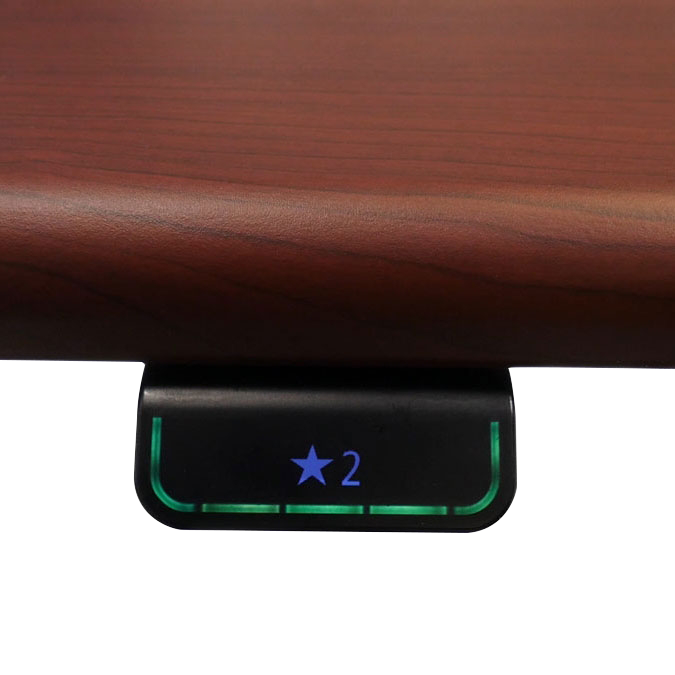 The Lander’s unique hand controller combines multiple user-friendly features, like a comfortable single-tap feature for command the desk to move automatically to the next height position, hands-free, and an unobtrusive “light rope” that changes color to help remind people to sit or stand. For example, when it's green you're either standing or sitting at the right interval. When it pulses it’s time to switch back to standing. And when it turns orange, it's your signal that you’ve been sitting longer than you wanted to. Most importantly, it was designed around choice and personal preference. Its Bluetooth connection to your smartphone allows users to configure their preferences in a desk control app, which is a free download. Users can customize reminders to get as audible push notifications on their iPhone, iPad, or Android mobile devices. We’re going to be continuously adding new software features, too, all with an eye towards unobtrusively helping users spend more time standing, and measuring their usage so they can manage to their personal goals, and share data with other health tracking applications. The many published studies on this subject show that when employees use their standing desks more, they're better employees. They have reduced sick days, they're more focused, they're more productive, and they're less stressed. According to Dr. James Levine, Obesity Chair of the Mayo Clinic, the return on investment is typically between $3 and $7 for every $1 invested in workplace interventions that help people be more active on their jobs. The more standing time that companies can encourage out of their employees, the higher the ROI.